For many people, the garden is not only a place to grow plants and flowers; it is also a place to relax and enjoy during the warmer months of the year. Gardens and patios serve as outdoor living spaces for reading and relaxing, for entertaining, and for dining and spending time with family and friends. The garden table is the focal point for these activities therefore having the right table is a quintessential part of any outdoor living space. 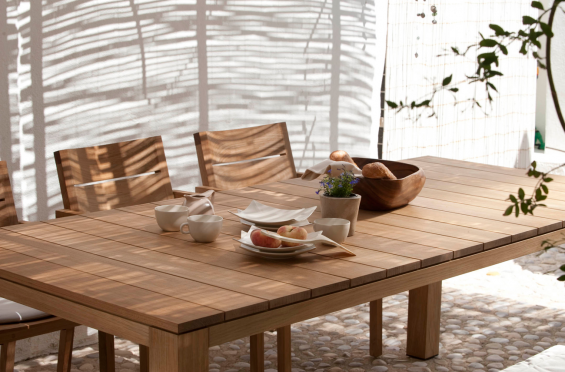 The use of wood, especially teak, is perfect for most outdoor spaces as it compliments almost all styles. 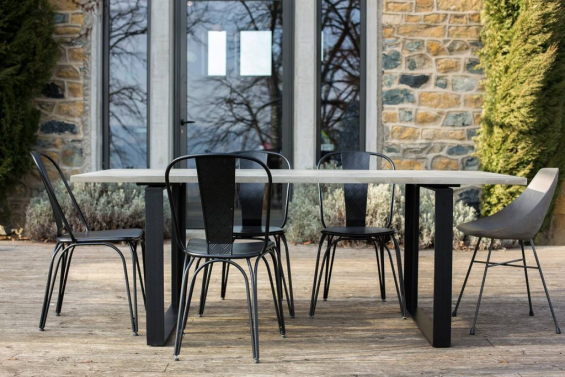 Solid teak tables age beautifully outdoors, developing a weathered-grey look over time; ensuring your outdoor furniture maintains its high-end look. Teak is also a strong and durable wood that requires little maintenance making it the perfect addition to your outdoor living space. This large table provides ample space to socialise and dine and the classic slatted tabletop and chairs make it easy to pair with your choice of textiles. If you like to entertain and dine outside during the warmer months then we recommend this handmade teak KOS Outdoor Table Set from Tribu. 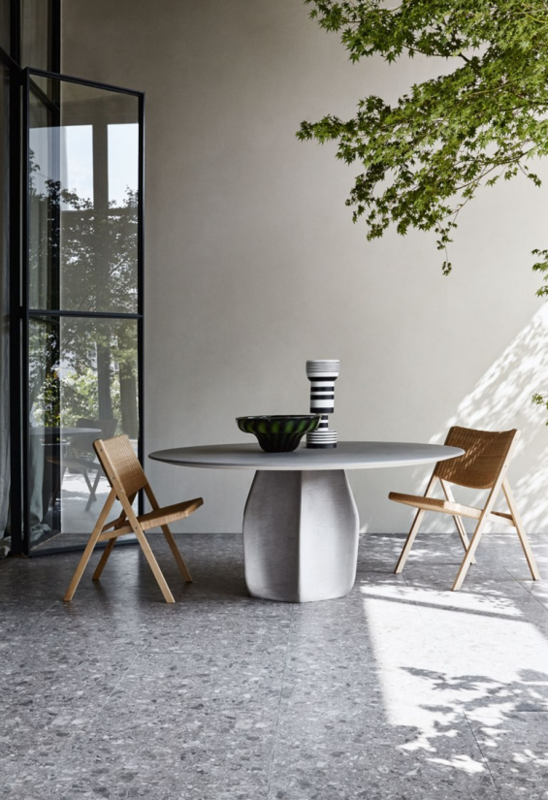 Unusual yet modest tables can make a great addition to modern, minimalist spaces as they add character to the space whilst maintaining that minimalist style. There is a wide variety of designs on the market so it will be easy to choose a style of table that reflects your needs and the rest of your outdoor living space. If you like to relax in your garden with a good book and a glass of wine or coffee then we recommend this generously sized wooden Asterias Table from Archiproducts. Its unconventional central base is inspired by the Asterias Cactus and this feature is what makes this table beautifully unique. Concrete is a revered cornerstone of contemporary design and has become one of 2017 biggest home and lifestyle trends. It is a hard-wearing material that can create a rough texture as well as a slick, luxurious one making it an eye-catching focal point to your outdoor living space. If you want a contemporary style table to entertain and socialise on then we recommend this concrete Alps Dining Table from Lyon Beton. This large durable table is spacious and its minimalist design allows you to match with a wide variety of chairs, stools and benches. 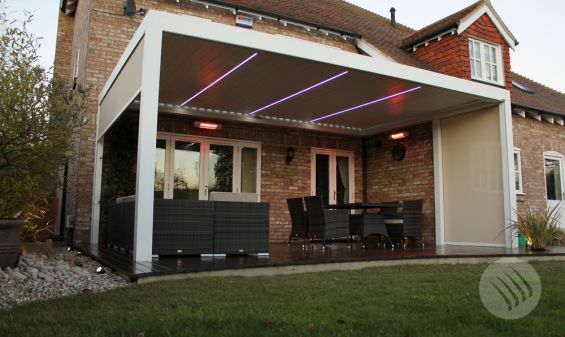 If you are looking to create the perfect outdoor living space then an Outdoor Living Pod™ is a contemporary garden feature that has been designed to provide sun, shade and shelter with style. This is alfresco dining at its finest, the Pod is an extension of your home, bringing the indoors to the outdoors and making that natural connection. This louvered roof system is electronically operated to give you full control of the light and air that passes through to your social space so that you can always execute the perfect dining experience every time. With an integrated guttering system fixed around the internal perimeter of the roof you will never have to retreat early and ruin your plans because of a sudden weather change. The Outdoor Living Pod™ is your all-weather terrace covering that will enhance your lifestyle and transform your patio and garden space.